Pilots drop the second game two 6-7 in a game with several lead changes, but win the rubber match 7-6! Another series win and a series win away from Joe Etzel. This ties our overall win total from last year. USF looks to be the team to beat so far in the WCC season. So, the sweep doesn't feel as bad, but we could have turned two of those games in our favor. You live and learn. Who edited our Portland Pilots Wikipedia history to have this amazing baseball history section? SouthCarolinaPilot wrote: Who edited our Portland Pilots Wikipedia history to have this amazing baseball history section? 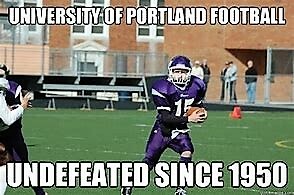 Pilots Football, Undefeated Since 1950! They won a game in 1950? 1950? That's nothing. St. Mary's Academy, downtown, has been undefeated in football since 1859. Well, the weekend at Gonzaga was less than desirable. But, we followed it up with an extra innings victory over the Ducks! We had the lead heading into the 9th but the Ducks tied it up. We pushed across two runs in the 11th and held on. I will take any victory over Oregon or Oregon State! We host BYU this weekend. It's a Thursday to Saturday schedule, so be prepared. Winning 2 of 3 to take the series against BYU feels good and CougarBoard tears taste good. That’s all. The Pilots knocked off first place LMU tonight 6-1 in LA to open the series! Freshman pitcher Eli Morse went the distance for the win. Game 2 is Saturday at 6pm... video and live stats are available. Pilots take game 2, 2-1 for their first series win over LMU since 2013! Watched the Pilots play the Beavers last night, in what was deemed a home game for the Pilots, before a sold out crowd filled with the Beaver faithful. The headline I read this morning indicates that the Beavers succeeded in "holding off" the Pilots. Final score was 9-2; it could have been far worse for the Pilots, who did not appear to be held off by the Beavers. Beavers left a number of runners on base. Pretty much outplayed the Pilots--Beavers are good. Our pitchers had trouble finding the strike zone all night in a long game that went from 5:00 p.m. to nearly 9:00 p.m. This is may not be a measure of our season so far which has been a pleasant surprise. Still evident that we are hardly in the same ballpark as Beavers. Yeah, tough to compare ourselves to OSU at this point. Lets hope that tonight vs. UO will provide a better showing. Pilots picked up the win 2-1 over the Ducks today! What a beautiful day for an evening game at Etzel Field. Stonehouse wrote: Pilots picked up the win 2-1 over the Ducks today! What a beautiful day for an evening game at Etzel Field. Not just that, but it was a season sweep of the Ducks! Random: is anyone else bothered by the fact that we just played Oregon State and Oregon in Portland and the Oregonian clearly couldn't be bothered to send a reporter out to cover the games? The write-up for the Oregon State game is clearly from someone looking at a box score and there is no mention of the Oregon game. SouthCarolinaPilot wrote: .....the Oregonian clearly couldn't be bothered to send a reporter out to cover the games? Stopped by the Etz for 3 innings of play today and watched UP and UOP score 9 runs. The two teams combined for only 2 more the rest of the way as the Pilots took the series finale, 7-4. Finals and graduation in the week ahead, the Pilots will play their last home series of the season May 11-13 against USD. We swept Seattle U in the midweek series! This weekend are our final three home games which are against San Diego. Our final series takes us to currently WCC-leading Pepperdine. Let's hope for a strong finish! Baseball took 1 of 3 from San Diego. It feels weird to have taken games from Saint Mary's, BYU, and LMU, but dropped games to Pacific and San Diego. Still can't complain with the upward trajectory of the team this season! *UP beat 1st place PU to move into a tie for 7th with SCU, a loser to GU. *Fifth place LMU blanked 4th place SMC to stay in contention for the final playoff spot. *Last place UOP knocked BYU out of a tie for 7th. Difficult to say where UP will finish in the standings, but with two WCC games remaining, both at PU, the Pilots still have a chance of avoiding last place for the first time in a long time. Pilots pick up a 4-0 win today to claim the rubber match at Pepperdine. Pepperdine still wins the WCC regular season title, since Gonzaga lost to Santa Clara today. Pilots finish with a 12-15 conference record and in a three-way tie for 6th with San Diego and Santa Clara. They have a 22-29 record overall, with one game at UCSB tomorrow remaining. Congrats to the baseball team and coaching staff on a promising season of growth and improvement! Pilots lost their last game of the season today, 1-0, on three straight singles by UCSB after two outs in the bottom of the 9th....and finish the season with a respectable 23-30 record. Remember, just last year the Pilots won 10 total games, including 5 during WCC play. The 1-0 loss to UCSB to close out the season was unfortunate, but you have to look at the overall results and be quite satisfied after the last few seasons. As DD already said, we won an additional 13 games this season and 7 more conference games. Last year's team won only 2 series (Seattle U and Santa Clara): 2-16 (1-8 in WCC). This year's team won 5 of 9 WCC series (Saint Mary's, Santa Clara, BYU, LMU, and Pepperdine) and went 8-8-1 overall in series. That's a huge improvement. We finished tied for 6th place in a very crazy WCC season. The one series that I wish we could have had back is the San Francisco series (where we got swept). We will definitely miss all of the seniors next year, but a few that stood out to me with my limited viewing abilities were Tate Budnick, Corbin Powers, and Ryan Hoogerwerf. When I check my goal for the start of the season, the season appears to be a success. SouthCarolinaPilot wrote: Not last in the WCC. This was a competitive year in the WCC, but no team really stood out nationally the way that USD and Pepperdine have in the past. If this upward trend continues into next year, I think it might be reasonable to expect the team to be competing for one of the top 4 WCC tournament spots. I agree that the results this year, including series wins over Pepp and LMU (2 of the conference tourney teams, who were both in first place at the time) was encouraging. If we can keep the momentum going, add in a new stadium in the next couple years, and I like where things are going. UP Athletics wrote: Portland's Cody Hawken was selected to the All-West Coast Conference First Team and Beau Brundage landed on the second team as four Pilots total where honored with postseason accolades, it was announced on Tuesday. Connor Knutson earned All-WCC Honorable Mention, while Eli Morse was voted to the conference's all-freshman team.